Winter !! Winter !! Winter !!! Well, Monday is here again. 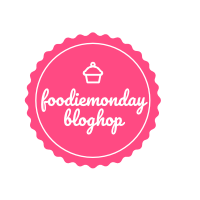 The Foodie Monday Blog Hop team has come with a theme as 'recipe of a co-blogger Pushpita Aheibam' who is a freelance feature writer by profession, food writer and blogger by passion, a wife, homemaker, a mother to an adorable boy as well. Her blog is a treasure of some traditional indigenous delicacies of her home state Tripura, as well as inherited Meitei (Manipuri) delicacies. Do check her blog Pushpita's Chakhum to know more in details. So for theme while going through her blog posts, I just came across a healthy and no-oil stew as 'No Oil Hawaithrak Makuchabi Kangshoi or Tender Green Peas Stew' which is so perfectly matched this ongoing cold weather. So for 121st Foodie Monday Blog Hop, I have just recreated her no-oil tender green peas stew for contribution, but in a vegan version. The green pea is a pod-shaped vegetable, widely grown as a cool season vegetable crop. This is an annual plant with a life cycle of one year. The green pea is grown in many parts of the world and the planting takes place from winter to early summer depending on location. Basically there are three varieties as sugar snap peas or snap peas, garden peas and snow peas. Snow pea pods are flat with very small peas inside. The whole pod is edible, although the tough strings along the edges are usually removed before eating. Snow peas are mildly flavored and can be served raw or cooked. Garden pea pods are firm, rounded and the round peas inside need to removed before eating (mainly the pods are discarded). The peas are sweet and may be eaten raw or cooked. These are the common peas that are sold shelled and frozen. Snap peas or sugar snap pea pods are a cross between snow pea pods and garden pea pods. Here the whole pod is eaten and has a crunchy texture and very sweet flavor. Snap peas may be eaten raw or cooked. There may be tough 'strings' at the seams of the pods that need to be removed before being eaten, but string-less varieties are also available these days. 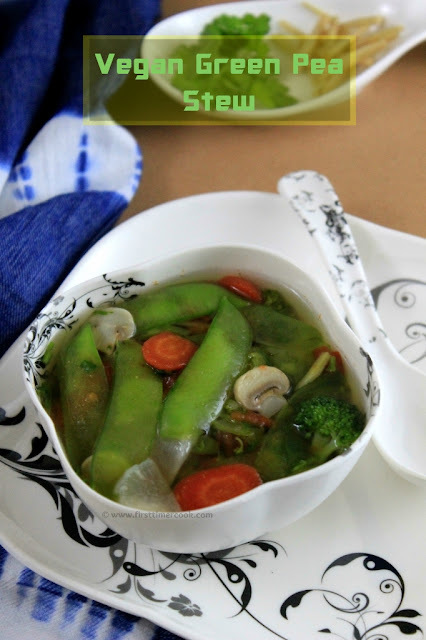 In this recipe, I have used some whole garden pea pods. But if the sugar snap pea pods or tender garden pea pods are available then go for that to use as a whole which has a sweet flavor. Since I have used the whole garden pea pods which are not tender so to use in stew made some modification. First separate the garden pea pod into two halves lengthwise. Hold half part of the pod lengthwise in such a way that the inner side of the pod'll be facing you. Gently break a little portion from tip towards you and pull it down. A thin tough membrane'll come out. If it breaks in the middle, then try the same method from tip of the other end. Discard those tough inner membranes and keep aside all the peels. These soft peels are finally used in the stew. This green pea stew is a vegan stew. 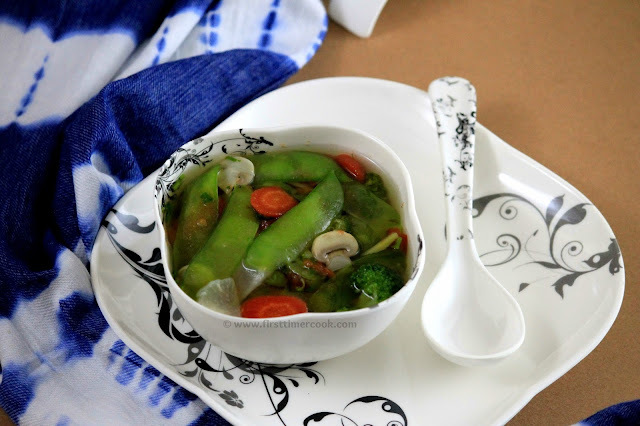 But any non-vegetarian item like meat, sea food etc can be used to make this a non-vegetarian stew. This vegan stew also prepared without using any oil. So there is nothing better to tuck into on a cold winter’s night than this healthy, no-oil, vegan hearty bowl of stew. Lets go in details method of preparation of this vegan green pea stew as mentioned below. Wash and clean each vegetables well. Slice carrot and radish into equal size cylindrical ovals. Also finely slice onion, mushroom and french beans. Keep aside. Now separate the garden pea pod into two halves lengthwise. Hold half part of the pod lengthwise in such a way that the inner side of the pod'll be facing you. Gently break a little portion from tip towards you and pull it down. A thin tough membrane'll come out. If it breaks in the middle, then try the same method from tip of the other end. Discard those tough inner membranes and keep aside all the peels. Skip this step if using sugar snap pea pod or tender garden pea pod. 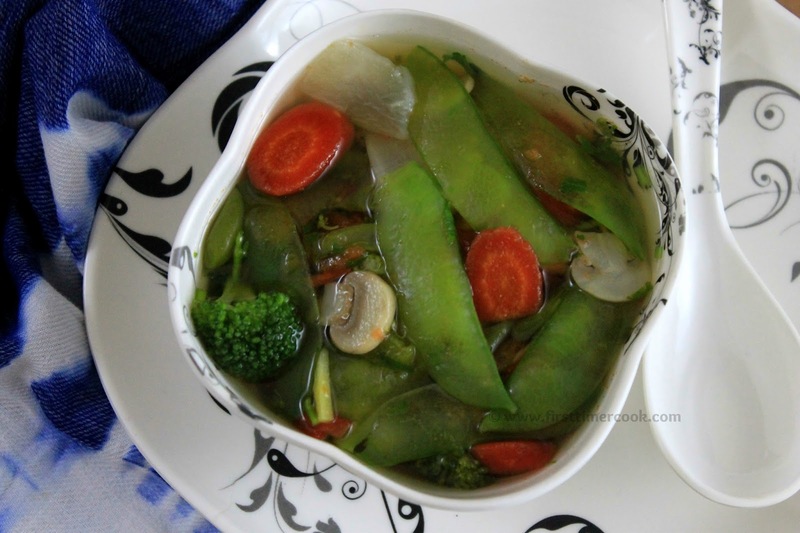 Next to reduce the cooking time, do a quick-blanch by putting carrot slices, radish slices, french bean slices, mushroom slices, broccoli florets and peels of snow pea pods in hot water for 3-4 minutes. Then drain and transfer all the blanched vegetables to a bowl and keep aside. Now heat 1 tsp water in a non-stick deep bottomed pan, add chopped onion and saute for few seconds. Add 500 ml water to the pan and bring to a rolling boil. Next reduce the heat to low-medium and add blanched carrot slices, radish slices, broccoli florets, mushroom slices, salt. Simmer for few minutes. Then add beans, peels of garden pea pods, chopped tomatoes, ginger julienne and cook for few more times. Finally turn off heat, add chopped coriander leaves, give a gentle stir and cover the pan with a lid. After 5 minutes open the lid, transfer to serving bowls and serve immediately ! Any other vegetables can be added in this stew. Also some meat or fish can be chosen to make it a non-vegetarian version. Do not add water at later steps, otherwise the stew will not be flavorful. This healthy , oil free stew is perfect for the cold weather here.. beautifully presented ! This is exactly what we need right now in Bangalore as its really cold. A hearty healthy stew. What a healthy bowl of delicious goodness!This is the season for tender peas!Loved the recipe! Healthy and yummy share! !Perfect for winters.